Warrant Officer David "Heavy" Whalley's 36-year career in search and rescue is punctuated by some of Scotland's worst aviation disasters. He was a senior team leader at Lockerbie when a Pan Am jumbo jet with 258 passengers crashed on the town in the Scottish borders in 1988. His team found the aircraft's black box recorder. Heavy - the nickname by which friends and colleagues know him - was also involved in the hunt for survivors when a Chinook helicopter crashed on Mull of Kintyre in 1994. The four RAF crew and 25 terrorism experts, who had been flying from Northern Ireland, died. Shortly after he was first admitted to the RAF's search and rescue service his first call-out was to help trace a downed Viscount aircraft. The three-day search ended with recovery of the dead crew from Ben More, near Crianlarich. However, his first mountain rescue involving civilians will be forever etched on his mind. The 54-year-old said: "It was Five Finger Gully in Lochaber. "I was out with the old and bold Lochaber boys looking for a young couple. "The girl, who I think was French, had fallen and died and her boyfriend was badly injured. "The team tried to save her life. One of the Lochaber team, Willie, who didn't know me, really looked after me that day." For a man who was initially turned away from search and rescue (SAR) because he was deemed to be too small, Heavy has become a veteran of countless rescues and earned his nickname for his size and spirit along the way. Heavy, whose RAF trade is catering, has become a specialist in the field. He talks quickly, never seeming to take a breath, of "epics" (his word for close calls with coming a cropper in the hills), about a successful ascent of Everest and trail-blazing new routes in the Falklands. 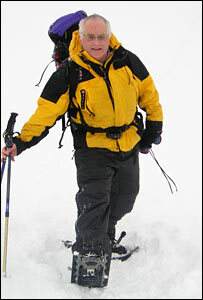 However, he still admits to being unnerved by the extreme conditions in the Scottish hills. Describing a rescue effort in the Cairngorms last year, he said: "I had just finished my shift and went down to Glenmore Lodge to see what I could do to help. "Up on the hill the winds were gusting 60-80mph. "A helicopter took myself and others and landed at 3,000ft. "It was a bumpy ride - it was really scary. How the crew got that helicopter up there was magnificent." 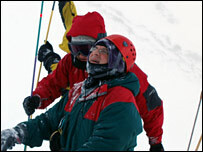 Heavy said he understood climbers', mountaineers' and hill walkers' passion for mountains. Brought up in Ayr, his Church of Scotland minister father regularly took him for walks in the Southern Uplands, Arran and Glencoe. 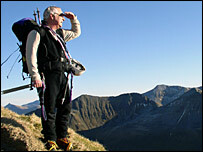 He has climbed all Scotland's Munros seven times. Heavy said: "To do this job you have to love the mountains." But the actions of a minority continue to surprise him. "The mobile phone is fantastic, but some people think it is the answer to everything," he said. "Remember there you're not always going to get a signal and always have the batteries charged - a number of times I've been speaking to someone needing assistance and their battery fails. "Civilian teams are increasingly finding themselves talking people down off hills on their mobile phones." A strange incident on the Cobbler, a hill near Arrochar, one summer stands out. Heavy said: "There was a guy walking in front of me in his bare feet. "He said he was doing it to train his mind."